An American Airlines Airbus A319 airplane takes off from Ronald Reagan Washington National Airport in Arlington, Va. 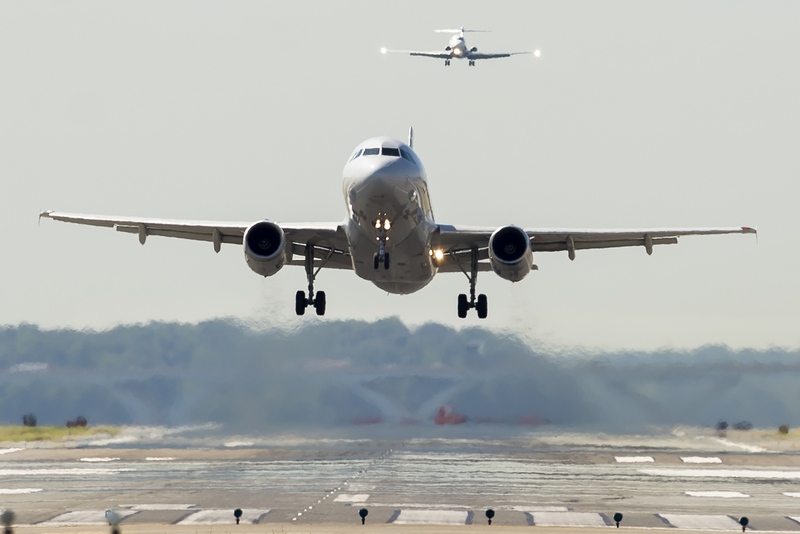 The U.S. Department of Transportation released a statistic on Wednesday that should surprise no one who flies: In the first six months of the year, nearly 1 in every 5 flights was delayed. Flights can be delayed for reasons ranging from bad weather to mechanical problems, but airlines know delays are a problem. Sarah, a corporate training professional based in Texas, is a frequent flier and writes the travel blog Road Warriorette. (She didn't want her last name used because her employer doesn't know about her blog.) Sarah recalls one flight to Charlotte, N.C., that was already delayed an hour and a half. "We took off. We hit a bird and had to turn around and come back," Sarah remembers. "At that point, they were like, 'Sorry guys, but your pilots and crew are timing out and so we're gonna have to wait another two hours for a new crew to come in.' "
To prevent fatigue, the FAA limits how long pilots can work. So, if your plane can't make it to its destination before the pilots reach their limit, it doesn't take off. The flight is delayed until another flight crew can be found. Timing out is one of the more common reasons for flight delays and can frustrate even the Road Warriorette. "We were supposed to arrive in Charlotte at 11 p.m.," Sarah remembers. "We arrived at 4 a.m., which is later, especially when you have to be at the office at 8." To reduce those kinds of delays, American Airlines wants its pilots to fly faster, taxi faster and take other steps to reduce flight times so they don't time out. In an email message to employees last month, American COO Robert Isom told dispatchers and pilots to "utilize speed up flight plans to reduce delays involving crew duty times." What exactly are "speed up flight plans," then? "It's flight plans that are submitted to us that have speeds which in some cases reach near the aircraft limitation or are not prudent in areas that contain turbulence," says Capt. Dennis Tajer, an American pilot and a spokesman for the pilots union. Tajer calls it "pilot pushing," and he says in the process, the airline is thinning the margin of safety. "Coming off of normal flight plans just to accommodate an overscheduled airline to avoid an FAA legal limitation from happening is not a part of the safety culture that our pilots are obligated and committed to maintaining," he says. Pilots do have the final say over flight plans, and Tajer says passengers should know that they will reject efforts by the airline to speed up if pilots feel it is not safe. "We are the checks and balances," Tajer says. "We're on that airplane with them and we've got your back, so nothing's gonna change on that." And that's the way even frequent flier Sarah prefers it. "I trust my pilots to do the safest thing," Sarah says. "Safety is first to me. I would rather arrive late and even have an overnight delay rather than fly unsafely through turbulence." American Airlines would not comment on air for this story, but a spokesman said in a statement, "safety and regulatory compliance are always the first and foremost consideration in every decision" the company makes. The statement calls American's pilots "the best in the business," and it goes on to point out that the speed-up flight plan is a "common practice of expediting the flight when appropriate, usually by flying the aircraft a little faster." After all, we've all heard those pilot announcements after a late departure, saying we're going to make up a little time in the air. But American says it's always done within FAA regulations and with the agreement of the captain. Dean DeBiase, who is on the faculty at the Northwestern University Kellogg School of Management and has worked with airlines on efficiencies, says over the past decade, American and other airlines have cut costs, raised fees and crammed more seats into planes. "So now they have capacities at the right level, fuel costs are down, let's invest a little more to bring our customer service stats up," DeBiase says. And DeBiase says with airline profits now flying high, airlines want to tackle one of their customers' biggest complaints, on-time performance. "Why don't I spend a little extra money on fuel so I reduce the number of cancellations and delays — and one of the ingredients in that is, yeah, I might have a crew that could make this flight if we turned it around quicker and got it off to Chicago," DeBiase says. But DeBiase says such a push for efficiency is a balancing act. Especially in a large and recently merged airline like American — which merged with US Airways in 2013 — change can be unsettling, for employees and customers alike.